The Hollywood Reporter is claiming that they have learned that the world premiere of Star Wars: Episode VII The Force Awakens will be taking place in Los Angeles, California on December 14th! They also add that subsequent premieres will take place in London and other parts of the world. Cast and crew members such as Director J.J. Abrams, John Boyega(Finn), Daisy Ridley(Rey), Oscar Isaac(Poe Dameron), Mark Hamill(Luke Skywalker) and others are expected to appear at the premiere in L.A. but none of that information is known at this time. Disney refused to comment on this news, so until it's officially confirmed we have to take it as a rumor. It's also unclear which theater Episode VII could premiere at. 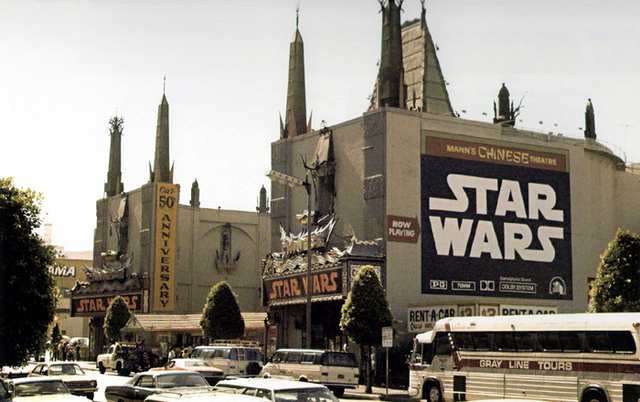 Perhaps for old time's sake Star Wars could return to Grauman's Chinese Theater where A New Hope first premiered back in 1977(seen at top). The Force Awakens is set to premiere in the U.S. just a few days after on December 18th!